A painter of northern Italy of whom little is known; Luini produced several works in the city of Milan. He was born in Dumenza, in the region of Lombardy, and subsequently became known amongst the Lombard painters. He is said to have trained under Ambrogio Bergognone (1470s – 1524), of the Milanese School of painting. Though, it is also noted that Luini trained under Bergognone’s more prominent contemporary, Leonardo da Vinci (1454 – 1519). Luini and his fellow student, Giovanni Antonio Boltraffio (1466 – 1516) were both successful students from Leonardo’s studio. Some of the works completed by Luini and Boltraffio, or Beltraffio, were signed in Leonardo’s name. Luini may have worked within this studio for some time, before establishing his own reputation as a master of frescos by about 1507. Most of his most notable documented work was for the Old Monastery - St. Maurice of Milan, commissioned by the Count Giovanni Bentivoglio. His frescos in the Villa Pelucca in Sesto San Giovanni and in the church of Santa Maria dei Miracoli in Saronno are also notable. He was well known for his fresco work in chapels and city buildings through Milan, but also completed several noteworthy oil paintings. These include Madonna of the Rose Hedge, which show Madonna’s gaze in Luini’s classic Luinesque, or squinted eyes, that his female figures were known for. Another well known piece, Herodias, painted between 1527 and 1531, was originally claimed as Leonardo da Vinci’s, but was rightfully attributed to Luini in 1793, and has since been in the Uffizi Gallery. This piece shows Luini’s classical style and one that implores a sense of pathos and suffering; seen beautifully in his frescos. 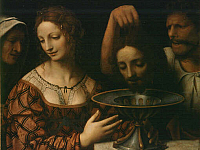 Still, in the accounts of Luini that do survive, he is not described as an intellectual painter, but as a sweet, light hearted man of high religious ideals.